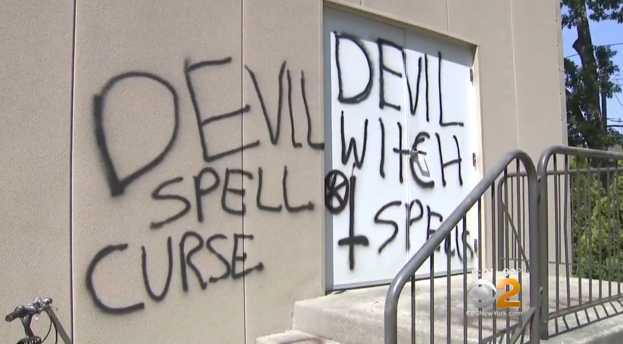 LONG ISLAND, N.Y. — Vandals have spray-painted a Long Island church with upside-down crosses and the words “devil” and “witch spells,” reports state. According to reports, the vandalism occurred either Sunday night or Monday morning under the cover of darkness. The glass on the front door was smashed and words and symbols were spray painted on the exterior walls, doors and steps. Some of the words included “devil,” “witch spells” and “curse,” and hex symbols and upside-down crosses were also painted on the building. While Nassau County Police are investigating the matter as a hate crime, there is also suspicion that the act was carried out by teenagers. “When the detectives were here, they said they think it’s kids because number one, they spelled the things wrong,” Taormina told local television station WABC. There is no security footage, so police are depending on the public for tips. Volunteers helped to cover up the graffiti on Tuesday, and Taormina says he will be installing cameras. “It was reported Saturday that the Flat Rock Church and cemetery located north of Arkansas Highway 56 had been vandalized. Deputy Steve Davidson found the headstones, the inside and outside of the church had been spray-painted with graffiti along with what is believed to be various Satanic symbols,” the Izard County Sheriff’s Department outlined in a social media post in January. The graffiti disturbed several residents whose family members either were married or are buried on the site.